A picture says a thousands words. Not only does it make your page more interesting but at the same time it also encourages social sharing. And what could be better than a captivating slide show to capture your user’s attention! It not only gives a lot of information in a limited space but also increases retention of information with the user. Today, we bring you a Slideshow Gallery Plugin for WordPress that allows you to feature images in an animated way with loads of configuration settings, adjustable as per your needs and requirements. So get ready to boost the user interaction on your WordPress site with today’s freebie. Grab this awesome plugin for FREE. 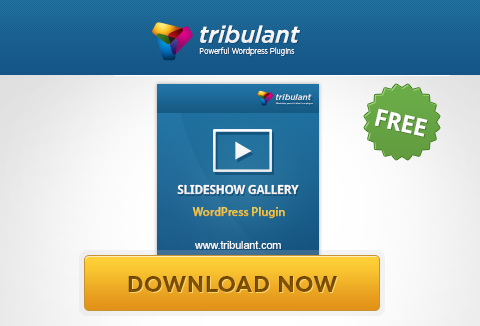 Slideshow Gallery Plugin for WordPress brought to you by Tribulant. 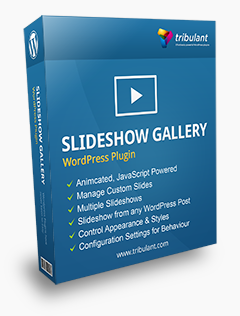 The slideshow gallery plugin for WordPress gives you the ability to either manage your own custom slides to display or it can use the gallery images uploaded to WordPress posts through the media uploader. It is extremely easy and quick to put slideshow galleries into your WordPress posts/pages with the use of WordPress shortcodes. Each slideshow can display a different set of images.Hardcoding the slideshow gallery into your WordPress theme is also a breeze with a single line of code and a detailed set of instructions in the documentation over at the WordPress codex. A full blown configuration section allows you to tweak and tune the plugin according to your needs and preferences.Not only can you set speeds, intervals and sizes of elements but you can also change colors and other factors related to the appearance and style of your slideshows. Ready to grab this awesome WP plugin absolutely FREE?